My intended topic for today was about femmephobia specifically, but as I wrote, I realized I needed to write a foundation piece about the general relationship between (modern) corsets and feminism! I don't claim to be any sort of expert on the latter, though I am passionately intersectional. First, let's be clear: the goal of feminism is equality between sexes. Not for women to replace or subjugate men or anything like that. Intersectional feminism advocates for equality not just between cis men and cis women, but also for trans and non-binary people, disabled people, people of color, and other marginalized groups. So feminists seek to "liberate" us from societal obligation to dress or look a certain way, rather than impose a new standard of dress to replace it. With this in mind, modern corsetry fits happily! Yes, corsetry can support a mainstream beauty narrative (creating a figure that is perceived as more fertile and therefore more biologically desirable), but rarely do I see the same level of anger and mistrust directed at heeled shoes, all forms of makeup, hair dye, etc., all of which are far more often complicit in a youth-and-slenderness obsessed concept of beauty. It's worth noting that while corsets reduce the waist, the goal of their shaping is to create or dramatize curves, not specifically to look "skinnier" or taller, etc. To those who wear corsetry often, particularly those who waist train and tightlace, it falls more into the same genre of body modification as tattoos and gauged ears. It is a personal aesthetic choice that actually crosses into lifestyle and subculture, and can bring people together who normally might never connect. The corset-wearing community is very supportive and particularly known for being body-positive. Through these personal aesthetic choices which may even defy the mainstream, we are able to claim ownership of our bodies. "I'm not here to decorate your world" is a corset wearer's maxim. Wearing a corset actually builds a connection between mind and body, with "listen to your body" being the cardinal rule of corsetry. This is directly opposite to the subtle patriarchal insistence that we deny, ignore, disconnect from, or feel shame for our bodies. A corset's all-day-hug feeling can combat anxiety, and it fine-tunes our perceptions of our body. 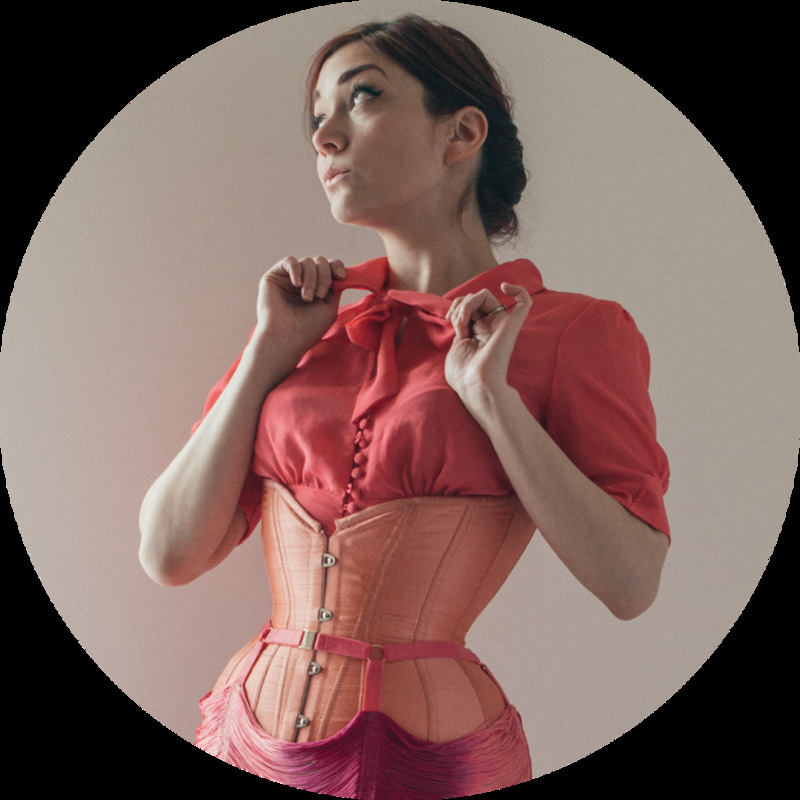 When I wear a corset regularly, I am more in tune with when I'm about to get sick, or start my period, and my meal times and portions tend to be more regular. While it's true that some people wear corsets in part for their partner, I also shy away from assuming that such a person it has been coerced. Who amongst us hasn't made certain adjustments to our style of dress based on the feedback of a partner? For example, wearing a certain color or cut of dress more often. Without more information, it's a patronizing assumption to make. Yes! Patronizing! As in patriarchy, as in that thought denies the agency of the individual making that decision. If it's not your body, it's neither your problem nor your business. Much of the backlash against corsetry also stems from the misguided idea that corsets are unhealthy, which is rarely the case. No, corsets will not crush your organs or break your bones! Corsets can actually have health benefits, though you hear them discussed far less often. The other idea is that corsets somehow hobble the wearer, but a well-fit corset should restrict your movement very little for most everyday activities. Sure, you can't slouch into your couch in one – but you're not going to convince me that boiled shrimp posture is an ideal of health to aspire to! Nor does a corset render one codependent when it comes to get (un)dressed. Able-bodied individuals are able to lace themselves up with a bit of practice. Those with reduced mobility or strength may have more difficulty, though custom lacing arrangements (zippers, front lacing, or fan lacing) can make corseting more accessible. Once on, corsets may provide support or relief from some of those strength and mobility issues. At the end of the day, if the person wearing the corset wants to be doing so, a corset is just as feminist as a pair of jeans or socks.